I’ve been a bit slack in updating my blog recently – what can I say? We’ve been test driving/towing the caravan to make sure that when we flee these cold, wet shores for the summer we won’t make any huge mistakes/forget important things (like attaching the brake cables) when we hit Brittany and Spain. We took our first trip to a lovely little campsite outside Tavistock – Woodovis Park – where the staff were friendly, helpful and reassuring to newbies like ourselves. This site is situated between Gunnislake and Tavistock and is a little jewel; it has everything you need – shop, clean, hot showers, washing machines and an indoor, heated, swimming pool. The only way in which the experience could have been improved would have been the weather, which had reverted to type and was wet, cold and windy. But we were snug, smug and warm. The second part of our trip was to Trethewett Farm, a camp site between Boscastle and Tintagel, which saw me do my first drive towing a caravan. I managed to scare myself silly by driving through the twists, turns and steep hills of Gunnislake – not to be recommended for the faint of heart. Himself was ‘calm’ and ‘supportive’ through gritted teeth and white knuckles. When I finally managed to find a lay-by I couldn’t get out of the drivers’ seat fast enough. Himself took over. We spent three nights at Trethewett Farm, two of which were more than a bit windy meaning our little Girl Dog slept on the pillows between us and I didn’t sleep at all worrying about flying off with a gust of wind and sailing down the North Coast of Cornwall. I had actually forgotten how beautiful my county is; one of the drawbacks of being a native is you don’t get to do much sightseeing as you are either working or the county is full of tourists, the roads get clogged and parking is exorbitant – if you’re lucky enough to find it. To have the chance to explore it again has been lovely. I do love the North Coast with its mystical, wild and rocky coastline, fantastic surfing and gorgeous beaches, it beats the South Coast any day of the week. The walks are spectacular too, we did the ‘easy’ route along the coast path into Boscastle (and saw a Chough!). I’m not sure I would have described it as ‘easy’ as some of it was more than a little challenging and had steps hewn into the cliffside to help out. These saw me crawling up them, breathless and quivering, desperately clinging to the grass at the side and with my eyes shut, as I’m not too fond of heights and there appeared to be a sheer drop into the boiling mass of sea down below. Himself told me off for being melodramatic. However, Boy Dog had to have a nap halfway through and then a carry up the steps, which I felt proved a point. However, finally getting into Boscastle was worth it. I felt I had achieved a major breakthrough as for the last three years at least I have been unable to walk more than half a mile without severe knee pain; my bionic knee is certainly working well! Unfortunately, we’ve had to put off our trip to Asturias for a couple of weeks as, since the caravan trip, Boy Dog has become quite poorly. He’s very lethargic, drinking copiously, eating ferociously and gained 2 kg in a fortnight, which given he is a small terrier is quite significant. He doesn’t appear to be in any pain but he’s just lying around the house not engaging in anything at all. He’s at the Vets today for more blood tests, an ultrasound and X-Rays in the hopes we can find out what is the matter and make him better. Girl Dog is missing him. We are too. 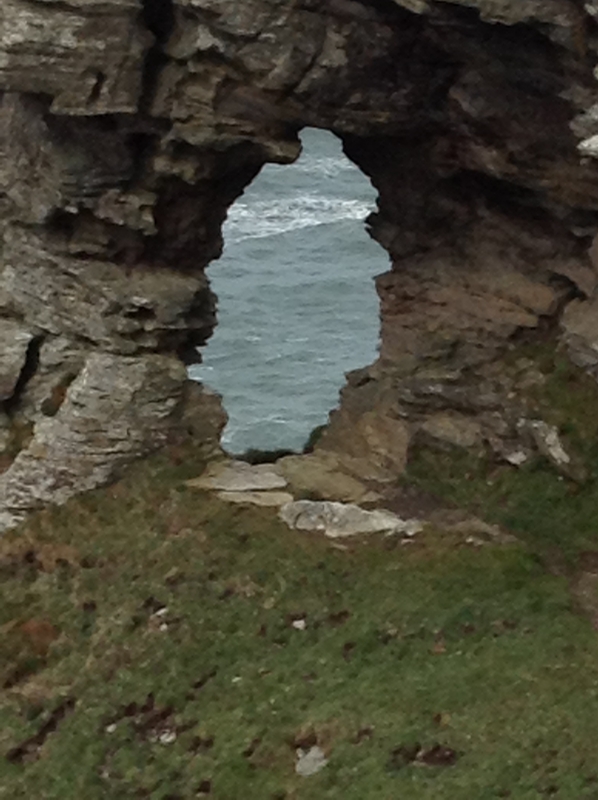 The photo this week shows a view through the rocks on the Tintagel to Boscastle cliff path. Many thanks to Himself for the photograph.